This article is about the chemical element. For other uses, see Titanium (disambiguation). Titanium was discovered in Cornwall, Great Britain, by William Gregor in 1791, and was named by Martin Heinrich Klaproth after the Titans of Greek mythology. The element occurs within a number of mineral deposits, principally rutile and ilmenite, which are widely distributed in the Earth's crust and lithosphere, and it is found in almost all living things, water bodies, rocks, and soils. The metal is extracted from its principal mineral ores by the Kroll and Hunter processes. 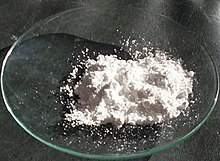 The most common compound, titanium dioxide, is a popular photocatalyst and is used in the manufacture of white pigments. Other compounds include titanium tetrachloride (TiCl4), a component of smoke screens and catalysts; and titanium trichloride (TiCl3), which is used as a catalyst in the production of polypropylene. Titanium can be alloyed with iron, aluminium, vanadium, and molybdenum, among other elements, to produce strong, lightweight alloys for aerospace (jet engines, missiles, and spacecraft), military, industrial processes (chemicals and petrochemicals, desalination plants, pulp, and paper), automotive, agri-food, medical prostheses, orthopedic implants, dental and endodontic instruments and files, dental implants, sporting goods, jewelry, mobile phones, and other applications. The two most useful properties of the metal are corrosion resistance and strength-to-density ratio, the highest of any metallic element. In its unalloyed condition, titanium is as strong as some steels, but less dense. There are two allotropic forms and five naturally occurring isotopes of this element, 46Ti through 50Ti, with 48Ti being the most abundant (73.8%). Although they have the same number of valence electrons and are in the same group in the periodic table, titanium and zirconium differ in many chemical and physical properties. As a metal, titanium is recognized for its high strength-to-weight ratio. It is a strong metal with low density that is quite ductile (especially in an oxygen-free environment), lustrous, and metallic-white in color. The relatively high melting point (more than 1,650 °C or 3,000 °F) makes it useful as a refractory metal. It is paramagnetic and has fairly low electrical and thermal conductivity. Commercially pure (99.2% pure) grades of titanium have ultimate tensile strength of about 434 MPa (63,000 psi), equal to that of common, low-grade steel alloys, but are less dense. Titanium is 60% denser than aluminium, but more than twice as strong as the most commonly used 6061-T6 aluminium alloy. Certain titanium alloys (e.g., Beta C) achieve tensile strengths of over 1,400 MPa (200,000 psi). However, titanium loses strength when heated above 430 °C (806 °F). Titanium is not as hard as some grades of heat-treated steel; it is non-magnetic and a poor conductor of heat and electricity. Machining requires precautions, because the material can gall unless sharp tools and proper cooling methods are used. Like steel structures, those made from titanium have a fatigue limit that guarantees longevity in some applications. The metal is a dimorphic allotrope of an hexagonal α form that changes into a body-centered cubic (lattice) β form at 882 °C (1,620 °F). The specific heat of the α form increases dramatically as it is heated to this transition temperature but then falls and remains fairly constant for the β form regardless of temperature. Like aluminium and magnesium, titanium metal and its alloys oxidize immediately upon exposure to air. Titanium readily reacts with oxygen at 1,200 °C (2,190 °F) in air, and at 610 °C (1,130 °F) in pure oxygen, forming titanium dioxide. It is, however, slow to react with water and air at ambient temperatures because it forms a passive oxide coating that protects the bulk metal from further oxidation. When it first forms, this protective layer is only 1–2 nm thick but continues to grow slowly; reaching a thickness of 25 nm in four years. Atmospheric passivation gives titanium excellent resistance to corrosion, almost equivalent to platinum. Titanium is capable of withstanding attack by dilute sulfuric and hydrochloric acids, chloride solutions, and most organic acids. However, titanium is corroded by concentrated acids. As indicated by its negative redox potential, titanium is thermodynamically a very reactive metal that burns in normal atmosphere at lower temperatures than the melting point. Melting is possible only in an inert atmosphere or in a vacuum. At 550 °C (1,022 °F), it combines with chlorine. It also reacts with the other halogens and absorbs hydrogen. Titanium is one of the few elements that burns in pure nitrogen gas, reacting at 800 °C (1,470 °F) to form titanium nitride, which causes embrittlement. Because of its high reactivity with oxygen, nitrogen, and some other gases, titanium filaments are applied in titanium sublimation pumps as scavengers for these gases. Such pumps inexpensively and reliably produce extremely low pressures in ultra-high vacuum systems. Titanium is the ninth-most abundant element in Earth's crust (0.63% by mass) and the seventh-most abundant metal. It is present as oxides in most igneous rocks, in sediments derived from them, in living things, and natural bodies of water. Of the 801 types of igneous rocks analyzed by the United States Geological Survey, 784 contained titanium. Its proportion in soils is approximately 0.5 to 1.5%. Common titanium-containing minerals are anatase, brookite, ilmenite, perovskite, rutile, and titanite (sphene). Akaogiite is an extremely rare mineral consisting of titanium dioxide. Of these minerals, only rutile and ilmenite have economic importance, yet even they are difficult to find in high concentrations. About 6.0 and 0.7 million tonnes of those minerals were mined in 2011, respectively. Significant titanium-bearing ilmenite deposits exist in western Australia, Canada, China, India, Mozambique, New Zealand, Norway, Sierra Leone, South Africa, and Ukraine. About 186,000 tonnes of titanium metal sponge were produced in 2011, mostly in China (60,000 t), Japan (56,000 t), Russia (40,000 t), United States (32,000 t) and Kazakhstan (20,700 t). Total reserves of titanium are estimated to exceed 600 million tonnes. The concentration of titanium is about 4 picomolar in the ocean. 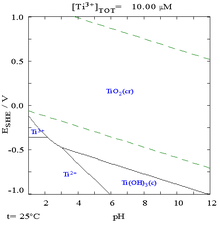 At 100 °C, the concentration of titanium in water is estimated to be less than 10−7 M at pH 7. The identity of titanium species in aqueous solution remains unknown because of its low solubility and the lack of sensitive spectroscopic methods, although only the 4+ oxidation state is stable in air. No evidence exists for a biological role, although rare organisms are known to accumulate high concentrations of titanium. Titanium is contained in meteorites, and it has been detected in the Sun and in M-type stars (the coolest type) with a surface temperature of 3,200 °C (5,790 °F). Rocks brought back from the Moon during the Apollo 17 mission are composed of 12.1% TiO2. It is also found in coal ash, plants, and even the human body. Native titanium (pure metallic) is very rare. Naturally occurring titanium is composed of 5 stable isotopes: 46Ti, 47Ti, 48Ti, 49Ti, and 50Ti, with 48Ti being the most abundant (73.8% natural abundance). At least 21 radioisotopes have been characterized, the most stable of which are 44Ti with a half-life of 63 years; 45Ti, 184.8 minutes; 51Ti, 5.76 minutes; and 52Ti, 1.7 minutes. All other radioactive isotopes have half-lives less than 33 seconds, with the majority less than half a second. The isotopes of titanium range in atomic weight from 39.99 u (40Ti) to 57.966 u (58Ti). The primary decay mode before the most abundant stable isotope, 48Ti, is electron capture and the primary mode after is beta emission. The primary decay products before 48Ti are element 21 (scandium) isotopes and the primary products after are element 23 (vanadium) isotopes. Titanium becomes radioactive upon bombardment with deuterons, emitting mainly positrons and hard gamma rays. See also: the categories Titanium compounds and Titanium minerals. The +4 oxidation state dominates titanium chemistry, but compounds in the +3 oxidation state are also common. Commonly, titanium adopts an octahedral coordination geometry in its complexes, but tetrahedral TiCl4 is a notable exception. Because of its high oxidation state, titanium(IV) compounds exhibit a high degree of covalent bonding. Unlike most other transition metals, simple aquo Ti(IV) complexes are unknown. The most important oxide is TiO2, which exists in three important polymorphs; anatase, brookite, and rutile. All of these are white diamagnetic solids, although mineral samples can appear dark (see rutile). They adopt polymeric structures in which Ti is surrounded by six oxide ligands that link to other Ti centers. The term titanates usually refers to titanium(IV) compounds, as represented by barium titanate (BaTiO3). With a perovskite structure, this material exhibits piezoelectric properties and is used as a transducer in the interconversion of sound and electricity. Many minerals are titanates, e.g. ilmenite (FeTiO3). Star sapphires and rubies get their asterism (star-forming shine) from the presence of titanium dioxide impurities. A variety of reduced oxides (suboxides) of titanium are known, mainly reduced stoichiometries of titanium dioxide obtained by atmospheric plasma spraying.Ti3O5, described as a Ti(IV)-Ti(III) species, is a purple semiconductor produced by reduction of TiO2 with hydrogen at high temperatures, and is used industrially when surfaces need to be vapour-coated with titanium dioxide: it evaporates as pure TiO, whereas TiO2 evaporates as a mixture of oxides and deposits coatings with variable refractive index. Also known is Ti2O3, with the corundum structure, and TiO, with the rock salt structure, although often nonstoichiometric. The alkoxides of titanium(IV), prepared by reacting TiCl4 with alcohols, are colourless compounds that convert to the dioxide on reaction with water. They are industrially useful for depositing solid TiO2 via the sol-gel process. Titanium isopropoxide is used in the synthesis of chiral organic compounds via the Sharpless epoxidation. Titanium forms a variety of sulfides, but only TiS2 has attracted significant interest. It adopts a layered structure and was used as a cathode in the development of lithium batteries. Because Ti(IV) is a "hard cation", the sulfides of titanium are unstable and tend to hydrolyze to the oxide with release of hydrogen sulfide. 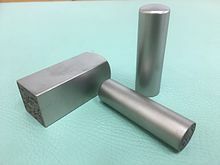 Titanium nitride (TiN) is a member of a family of refractory transition metal nitrides and exhibits properties similar to both covalent compounds including; thermodynamic stability, extreme hardness, thermal/electrical conductivity, and a high melting point. TiN has a hardness equivalent to sapphire and carborundum (9.0 on the Mohs Scale), and is often used to coat cutting tools, such as drill bits. It is also used as a gold-colored decorative finish and as a barrier metal in semiconductor fabrication. Titanium carbide, which is also very hard, is found in cutting tools and coatings. Titanium tetrachloride (titanium(IV) chloride, TiCl4) is a colorless volatile liquid (commercial samples are yellowish) that, in air, hydrolyzes with spectacular emission of white clouds. Via the Kroll process, TiCl4 is produced in the conversion of titanium ores to titanium dioxide, e.g., for use in white paint. It is widely used in organic chemistry as a Lewis acid, for example in the Mukaiyama aldol condensation. In the van Arkel process, titanium tetraiodide (TiI4) is generated in the production of high purity titanium metal. Titanium(III) and titanium(II) also form stable chlorides. A notable example is titanium(III) chloride (TiCl3), which is used as a catalyst for production of polyolefins (see Ziegler–Natta catalyst) and a reducing agent in organic chemistry. Owing to the important role of titanium compounds as polymerization catalyst, compounds with Ti-C bonds have been intensively studied. The most common organotitanium complex is titanocene dichloride ((C5H5)2TiCl2). Related compounds include Tebbe's reagent and Petasis reagent. Titanium forms carbonyl complexes, e.g. (C5H5)2Ti(CO)2. Following the success of platinum-based chemotherapy, titanium(IV) complexes were among the first non-platinum compounds to be tested for cancer treatment. The advantage of titanium compounds lies in their high efficacy and low toxicity. In biological environments, hydrolysis leads to the safe and inert titanium dioxide. Despite these advantages the first candidate compounds failed clinical trials. Further development resulted in the creation of potentially effective, selective, and stable titanium-based drugs. Their mode of action is not yet well understood. Titanium was discovered in 1791 by the clergyman and amateur geologist, William Gregor, as an inclusion of a mineral in Cornwall, Great Britain. Gregor recognized the presence of a new element in ilmenite when he found black sand by a stream and noticed the sand was attracted by a magnet. Analyzing the sand, he determined the presence of two metal oxides: iron oxide (explaining the attraction to the magnet) and 45.25% of a white metallic oxide he could not identify. Realizing that the unidentified oxide contained a metal that did not match any known element, Gregor reported his findings to the Royal Geological Society of Cornwall and in the German science journal Crell's Annalen. Around the same time, Franz-Joseph Müller von Reichenstein produced a similar substance, but could not identify it. 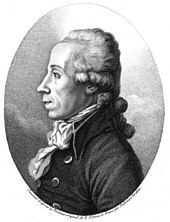 The oxide was independently rediscovered in 1795 by Prussian chemist Martin Heinrich Klaproth in rutile from Boinik (German name Bajmócska), a village in Hungary (now Bojničky in Slovakia). Klaproth found that it contained a new element and named it for the Titans of Greek mythology. After hearing about Gregor's earlier discovery, he obtained a sample of manaccanite and confirmed that it contained titanium. The currently known processes for extracting titanium from its various ores are laborious and costly; it is not possible to reduce the ore by heating with carbon (as in iron smelting) because titanium combines with the carbon to produce titanium carbide. Pure metallic titanium (99.9%) was first prepared in 1910 by Matthew A. Hunter at Rensselaer Polytechnic Institute by heating TiCl4 with sodium at 700–800 °C under great pressure in a batch process known as the Hunter process. Titanium metal was not used outside the laboratory until 1932 when William Justin Kroll proved that it can be produced by reducing titanium tetrachloride (TiCl4) with calcium. Eight years later he refined this process with magnesium and even sodium in what became known as the Kroll process. Although research continues into more efficient and cheaper processes (e.g., FFC Cambridge, Armstrong), the Kroll process is still used for commercial production. Titanium of very high purity was made in small quantities when Anton Eduard van Arkel and Jan Hendrik de Boer discovered the iodide, or crystal bar, process in 1925, by reacting with iodine and decomposing the formed vapours over a hot filament to pure metal. In the 1950s and 1960s, the Soviet Union pioneered the use of titanium in military and submarine applications (Alfa class and Mike class) as part of programs related to the Cold War. Starting in the early 1950s, titanium came into use extensively in military aviation, particularly in high-performance jets, starting with aircraft such as the F-100 Super Sabre and Lockheed A-12 and SR-71. Recognizing the strategic importance of titanium, the U.S. Department of Defense supported early efforts of commercialization. Throughout the period of the Cold War, titanium was considered a strategic material by the U.S. government, and a large stockpile of titanium sponge was maintained by the Defense National Stockpile Center, which was finally depleted in the 2000s. According to 2006 data, the world's largest producer, Russian-based VSMPO-AVISMA, was estimated to account for about 29% of the world market share. As of 2015, titanium sponge metal was produced in seven countries: China, Japan, Russia, Kazakhstan, the US, Ukraine, and India. (in order of output). In 2006, the U.S. Defense Advanced Research Projects Agency (DARPA) awarded $5.7 million to a two-company consortium to develop a new process for making titanium metal powder. Under heat and pressure, the powder can be used to create strong, lightweight items ranging from armour plating to components for the aerospace, transport, and chemical processing industries. The processing of titanium metal occurs in four major steps: reduction of titanium ore into "sponge", a porous form; melting of sponge, or sponge plus a master alloy to form an ingot; primary fabrication, where an ingot is converted into general mill products such as billet, bar, plate, sheet, strip, and tube; and secondary fabrication of finished shapes from mill products. Because it cannot be readily produced by reduction of its dioxide, titanium metal is obtained by reduction of TiCl4 with magnesium metal in the Kroll process. The complexity of this batch production in the Kroll process explains the relatively high market value of titanium, despite the Kroll process being less expensive than the Hunter process. To produce the TiCl4 required by the Kroll process, the dioxide is subjected to carbothermic reduction in the presence of chlorine. In this process, the chlorine gas is passed over a red-hot mixture of rutile or ilmenite in the presence of carbon. After extensive purification by fractional distillation, the TiCl4 is reduced with 800 °C molten magnesium in an argon atmosphere. Titanium metal can be further purified by the van Arkel–de Boer process, which involves thermal decomposition of titanium tetraiodide. A more recently developed batch production method, the FFC Cambridge process, consumes titanium dioxide powder (a refined form of rutile) as feedstock and produces titanium metal, either powder or sponge. The process involves fewer steps than the Kroll process and takes less time. If mixed oxide powders are used, the product is an alloy. Common titanium alloys are made by reduction. For example, cuprotitanium (rutile with copper added is reduced), ferrocarbon titanium (ilmenite reduced with coke in an electric furnace), and manganotitanium (rutile with manganese or manganese oxides) are reduced. About fifty grades of titanium and titanium alloys are designed and currently used, although only a couple of dozen are readily available commercially. The ASTM International recognizes 31 grades of titanium metal and alloys, of which grades one through four are commercially pure (unalloyed). Those four vary in tensile strength as a function of oxygen content, with grade 1 being the most ductile (lowest tensile strength with an oxygen content of 0.18%), and grade 4 the least ductile (highest tensile strength with an oxygen content of 0.40%). The remaining grades are alloys, each designed for specific properties of ductility, strength, hardness, electrical resistivity, creep resistance, specific corrosion resistance, and combinations thereof. In addition to the ASTM specifications, titanium alloys are also produced to meet aerospace and military specifications (SAE-AMS, MIL-T), ISO standards, and country-specific specifications, as well as proprietary end-user specifications for aerospace, military, medical, and industrial applications. Titanium powder is manufactured using a flow production process known as the Armstrong process that is similar to the batch production Hunter process. A stream of titanium tetrachloride gas is added to a stream of molten sodium metal; the products (sodium chloride salt and titanium particles) is filtered from the extra sodium. Titanium is then separated from the salt by water washing. Both sodium and chlorine are recycled to produce and process more titanium tetrachloride. All welding of titanium must be done in an inert atmosphere of argon or helium to shield it from contamination with atmospheric gases (oxygen, nitrogen, and hydrogen). Contamination causes a variety of conditions, such as embrittlement, which reduce the integrity of the assembly welds and lead to joint failure. Commercially pure flat product (sheet, plate) can be formed readily, but processing must take into account the fact that the metal has a "memory" and tends to spring back. This is especially true of certain high-strength alloys. Titanium cannot be soldered without first pre-plating it in a metal that is solderable. The metal can be machined with the same equipment and the same processes as stainless steel. Titanium is used in steel as an alloying element (ferro-titanium) to reduce grain size and as a deoxidizer, and in stainless steel to reduce carbon content. Titanium is often alloyed with aluminium (to refine grain size), vanadium, copper (to harden), iron, manganese, molybdenum, and other metals. Titanium mill products (sheet, plate, bar, wire, forgings, castings) find application in industrial, aerospace, recreational, and emerging markets. 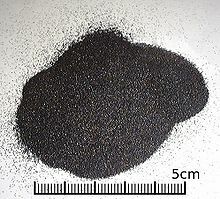 Powdered titanium is used in pyrotechnics as a source of bright-burning particles. 2), an intensely white permanent pigment used in paints, paper, toothpaste, and plastics. It is also used in cement, in gemstones, as an optical opacifier in paper, and a strengthening agent in graphite composite fishing rods and golf clubs. 2 pigment is chemically inert, resists fading in sunlight, and is very opaque: it imparts a pure and brilliant white colour to the brown or grey chemicals that form the majority of household plastics. In nature, this compound is found in the minerals anatase, brookite, and rutile. Paint made with titanium dioxide does well in severe temperatures and marine environments. Pure titanium dioxide has a very high index of refraction and an optical dispersion higher than diamond. In addition to being a very important pigment, titanium dioxide is also used in sunscreens. Because titanium alloys have high tensile strength to density ratio, high corrosion resistance, fatigue resistance, high crack resistance, and ability to withstand moderately high temperatures without creeping, they are used in aircraft, armour plating, naval ships, spacecraft, and missiles. For these applications, titanium is alloyed with aluminium, zirconium, nickel, vanadium, and other elements to manufacture a variety of components including critical structural parts, fire walls, landing gear, exhaust ducts (helicopters), and hydraulic systems. In fact, about two thirds of all titanium metal produced is used in aircraft engines and frames. The titanium 6AL-4V alloy accounts for almost 50% of all alloys used in aircraft applications. Because titanium is resistant to corrosion by sea water, it is used to make propeller shafts, rigging, and heat exchangers in desalination plants; heater-chillers for salt water aquariums, fishing line and leader, and divers' knives. Titanium is used in the housings and components of ocean-deployed surveillance and monitoring devices for science and the military. The former Soviet Union developed techniques for making submarines with hulls of titanium alloys forging titanium in huge vacuum tubes. Titanium is used in the walls of the Juno spacecraft's vault to shield on-board electronics. Welded titanium pipe and process equipment (heat exchangers, tanks, process vessels, valves) are used in the chemical and petrochemical industries primarily for corrosion resistance. Specific alloys are used in oil and gas downhole applications and nickel hydrometallurgy for their high strength (e. g.: titanium beta C alloy), corrosion resistance, or both. The pulp and paper industry uses titanium in process equipment exposed to corrosive media, such as sodium hypochlorite or wet chlorine gas (in the bleachery). Other applications include ultrasonic welding, wave soldering, and sputtering targets. Titanium tetrachloride (TiCl4), a colorless liquid, is important as an intermediate in the process of making TiO2 and is also used to produce the Ziegler–Natta catalyst. Titanium tetrachloride is also used to iridize glass and, because it fumes strongly in moist air, it is used to make smoke screens. Titanium metal is used in automotive applications, particularly in automobile and motorcycle racing where low weight and high strength and rigidity are critical. The metal is generally too expensive for the general consumer market, though some late model Corvettes have been manufactured with titanium exhausts, and a Corvette Z06's LT4 supercharged engine uses lightweight, solid titanium intake valves for greater strength and resistance to heat. Titanium is used in many sporting goods: tennis rackets, golf clubs, lacrosse stick shafts; cricket, hockey, lacrosse, and football helmet grills, and bicycle frames and components. Although not a mainstream material for bicycle production, titanium bikes have been used by racing teams and adventure cyclists. Titanium alloys are used in spectacle frames that are rather expensive but highly durable, long lasting, light weight, and cause no skin allergies. Many backpackers use titanium equipment, including cookware, eating utensils, lanterns, and tent stakes. Though slightly more expensive than traditional steel or aluminium alternatives, titanium products can be significantly lighter without compromising strength. Titanium horseshoes are preferred to steel by farriers because they are lighter and more durable. Titanium has occasionally been used in architecture. The 42.5 m (139 ft) Monument to Yuri Gagarin, the first man to travel in space (55°42′29.7″N 37°34′57.2″E﻿ / ﻿55.708250°N 37.582556°E﻿ / 55.708250; 37.582556), as well as the 110 m (360 ft) Monument to the Conquerors of Space on top of the Cosmonaut Museum in Moscow are made of titanium for the metal's attractive colour and association with rocketry. 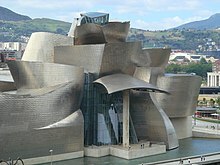 The Guggenheim Museum Bilbao and the Cerritos Millennium Library were the first buildings in Europe and North America, respectively, to be sheathed in titanium panels. Titanium sheathing was used in the Frederic C. Hamilton Building in Denver, Colorado. Because of titanium's superior strength and light weight relative to other metals (steel, stainless steel, and aluminium), and because of recent advances in metalworking techniques, its use has become more widespread in the manufacture of firearms. Primary uses include pistol frames and revolver cylinders. For the same reasons, it is used in the body of laptop computers (for example, in Apple's PowerBook line). Some upmarket lightweight and corrosion-resistant tools, such as shovels and flashlights, are made of titanium or titanium alloys. Relation between voltage and color for anodized titanium. (Cateb, 2010). Because of its durability, titanium has become more popular for designer jewelry (particularly, titanium rings). Its inertness makes it a good choice for those with allergies or those who will be wearing the jewelry in environments such as swimming pools. Titanium is also alloyed with gold to produce an alloy that can be marketed as 24-karat gold because the 1% of alloyed Ti is insufficient to require a lesser mark. The resulting alloy is roughly the hardness of 14-karat gold and is more durable than pure 24-karat gold. Titanium's durability, light weight, and dent and corrosion resistance make it useful for watch cases. Some artists work with titanium to produce sculptures, decorative objects and furniture. Titanium may be anodized to vary the thickness of the surface oxide layer, causing optical interference fringes and a variety of bright colors. With this coloration and chemical inertness, titanium is a popular metal for body piercing. Titanium has a minor use in dedicated non-circulating coins and medals. In 1999, Gibraltar released the world's first titanium coin for the millennium celebration. The Gold Coast Titans, an Australian rugby league team, award a medal of pure titanium to their player of the year. Because titanium is biocompatible (non-toxic and not rejected by the body), it has many medical uses, including surgical implements and implants, such as hip balls and sockets (joint replacement) and dental implants that can stay in place for up to 20 years. The titanium is often alloyed with about 4% aluminium or 6% Al and 4% vanadium. 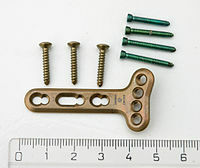 Medical screws and plate used for repair fracture of the wrist, scale is in centimeters. Titanium has the inherent ability to osseointegrate, enabling use in dental implants that can last for over 30 years. This property is also useful for orthopedic implant applications. These benefit from titanium's lower modulus of elasticity (Young's modulus) to more closely match that of the bone that such devices are intended to repair. As a result, skeletal loads are more evenly shared between bone and implant, leading to a lower incidence of bone degradation due to stress shielding and periprosthetic bone fractures, which occur at the boundaries of orthopedic implants. However, titanium alloys' stiffness is still more than twice that of bone, so adjacent bone bears a greatly reduced load and may deteriorate. Because titanium is non-ferromagnetic, patients with titanium implants can be safely examined with magnetic resonance imaging (convenient for long-term implants). Preparing titanium for implantation in the body involves subjecting it to a high-temperature plasma arc which removes the surface atoms, exposing fresh titanium that is instantly oxidized. Titanium is used for the surgical instruments used in image-guided surgery, as well as wheelchairs, crutches, and any other products where high strength and low weight are desirable. Titanium dioxide nanoparticles are widely used in electronics and the delivery of pharmaceuticals and cosmetics. Because of its corrosion resistance, containers made of titanium have been studied for the long-term storage of nuclear waste. Containers lasting more than 100,000 years are thought possible with manufacturing conditions that minimize material defects. A titanium "drip shield" could also be installed over containers of other types to enhance their longevity. The fungal species Marasmius oreades and Hypholoma capnoides can bioconvert titanium in titanium polluted soils. Nettles contain up to 80 parts per million of titanium. Titanium is non-toxic even in large doses and does not play any natural role inside the human body. An estimated quantity of 0.8 milligrams of titanium is ingested by humans each day, but most passes through without being absorbed in the tissues. It does, however, sometimes bio-accumulate in tissues that contain silica. One study indicates a possible connection between titanium and yellow nail syndrome. An unknown mechanism in plants may use titanium to stimulate the production of carbohydrates and encourage growth. This may explain why most plants contain about 1 part per million (ppm) of titanium, food plants have about 2 ppm, and horsetail and nettle contain up to 80 ppm. As a powder or in the form of metal shavings, titanium metal poses a significant fire hazard and, when heated in air, an explosion hazard. Water and carbon dioxide are ineffective for extinguishing a titanium fire; Class D dry powder agents must be used instead. When used in the production or handling of chlorine, titanium should not be exposed to dry chlorine gas because it may result in a titanium–chlorine fire. Even wet chlorine presents a fire hazard when extreme weather conditions cause unexpected drying. Titanium can catch fire when a fresh, non-oxidized surface comes in contact with liquid oxygen. Fresh metal may be exposed when the oxidized surface is struck or scratched with a hard object, or when mechanical strain causes a crack. This poses a limitation to its use in liquid oxygen systems, such as those in the aerospace industry. Because titanium tubing impurities can cause fires when exposed to oxygen, titanium is prohibited in gaseous oxygen respiration systems. 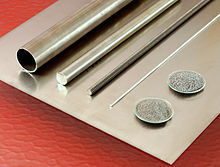 Steel tubing is used for high pressure systems (3,000 p.s.i.) and aluminium tubing for low pressure systems. ^ "titanium - definition of titanium in English | Oxford Dictionaries". Oxford University Press. 2017. Retrieved 2017-03-28. ^ Andersson, N.; et al. (2003). "Emission spectra of TiH and TiD near 938 nm" (PDF). J. Chem. Phys. 118: 10543. Bibcode:2003JChPh.118.3543A. doi:10.1063/1.1539848. ^ a b c d e f g h i "Titanium". Encyclopædia Britannica. 2006. Retrieved 29 December 2006. ^ a b c d e f g h i j k l m Lide, D. R., ed. (2005). CRC Handbook of Chemistry and Physics (86th ed.). Boca Raton (FL): CRC Press. ISBN 0-8493-0486-5. ^ a b c d e f g h i Krebs, Robert E. (2006). The History and Use of Our Earth's Chemical Elements: A Reference Guide (2nd ed.). Westport, CT: Greenwood Press. ISBN 978-0-313-33438-2. ^ a b c Barbalace, Kenneth L. (2006). "Periodic Table of Elements: Ti – Titanium". Retrieved 26 December 2006. ^ a b c d e Stwertka, Albert (1998). "Titanium". Guide to the Elements (Revised ed.). Oxford University Press. pp. 81–82. ISBN 978-0-19-508083-4. ^ Puigdomenech, Ignasi (2004) Hydra/Medusa Chemical Equilibrium Database and Plotting Software, KTH Royal Institute of Technology. ^ Forrest, A. L. (1981). "Effects of Metal Chemistry on Behavior of Titanium in Industrial Applications". Industrial Applications of Titanium and Zirconium. p. 112. ^ a b c d United States Geological Survey. "USGS Minerals Information: Titanium". ^ Buettner, K. M.; Valentine, A. M. (2012). "Bioinorganic Chemistry of Titanium". Chemical Reviews. 112 (3): 1863. doi:10.1021/cr1002886. PMID 22074443. ^ Liu, Gang; Huang, Wan-Xia; Yi, Yong (26 June 2013). "Preparation and Optical Storage Properties of λTi3O5 Powder". Journal of Inorganic Materials (in Chinese). 28 (4): 425–430. doi:10.3724/SP.J.1077.2013.12309. ^ Bonardi, Antonio; Pühlhofer, Gerd; Hermanutz, Stephan; Santangelo, Andrea (2014). "A new solution for mirror coating in $γ$-ray Cherenkov Astronomy" (Submitted manuscript). Experimental Astronomy. 38: 1–9. arXiv:1406.0622. Bibcode:2014ExA....38....1B. doi:10.1007/s10686-014-9398-x. ^ Greenwood, Norman N.; Earnshaw, Alan (1997). Chemistry of the Elements (2nd ed.). Butterworth-Heinemann. p. 962. ISBN 978-0-08-037941-8. ^ Saha, Naresh (1992). "Titanium nitride oxidation chemistry: An x-ray photoelectron spectroscopy study". Journal of Applied Physics. no. 7 (7): 3072–3079. Bibcode:1992JAP....72.3072S. doi:10.1063/1.351465. ^ Truini, Joseph (May 1988). "Drill Bits". Popular Mechanics. 165 (5): 91. ISSN 0032-4558. ^ Baliga, B. Jayant (2005). Silicon carbide power devices. World Scientific. p. 91. ISBN 978-981-256-605-8. ^ "Titanium carbide product information". H. C. Starck. Retrieved 16 November 2015. ^ Seong, S.; et al. (2009). Titanium: industrial base, price trends, and technology initiatives. Rand Corporation. p. 10. ISBN 978-0-8330-4575-1. ^ Johnson, Richard W. (1998). The Handbook of Fluid Dynamics. Springer. pp. 38–21. ISBN 978-3-540-64612-9. ^ Coates, Robert M.; Paquette, Leo A. (2000). Handbook of Reagents for Organic Synthesis. John Wiley and Sons. p. 93. ISBN 978-0-470-85625-3. ^ Tshuva, Edit Y.; Miller, Maya (2018). "Chapter 8. Coordination Complexes of Titanium(IV) for Anticancer Therapy". In Sigel, Astrid; Sigel, Helmut; Freisinger, Eva; Sigel, Roland K. O. Metallo-Drugs: Development and Action of Anticancer Agents. 18. Berlin: de Gruyter GmbH. pp. 219–250. doi:10.1515/9783110470734-014. ISBN 9783110470734. ^ Gregor, William (1791) "Beobachtungen und Versuche über den Menakanit, einen in Cornwall gefundenen magnetischen Sand" (Observations and experiments regarding menaccanite [i.e., ilmenite], a magnetic sand found in Cornwall), Chemische Annalen …, 1, pp. 40–54, 103–119. ^ Gregor, William (1791) "Sur le menakanite, espèce de sable attirable par l'aimant, trouvé dans la province de Cornouilles" (On menaccanite, a species of magnetic sand, found in the county of Cornwall), Observations et Mémoires sur la Physique, 39: 72–78, 152–160. ^ van Arkel, A. E.; de Boer, J. H. (1925). "Preparation of pure titanium, zirconium, hafnium, and thorium metal". Zeitschrift für anorganische und allgemeine Chemie. 148: 345–50. doi:10.1002/zaac.19251480133. ^ Yanko, Eugene; Omsk VTTV Arms Exhibition and Military Parade JSC (2006). "Submarines: general information". Retrieved 2 February 2015. ^ Stainless Steel World (July–August 2001). "VSMPO Stronger Than Ever" (PDF). KCI Publishing B.V. pp. 16–19. Retrieved 2 January 2007. ^ "Titanium Metals Corporation. Answers.com. Encyclopedia of Company Histories". Answers Corporation. 2006. Retrieved 2 January 2007. ^ "Roskill Information Services: Global Supply of Titanium is Forecast to Increase", Titanium Metal: Market Outlook to 2015 (5th edition, 2010). ^ "ISRO's titanium sponge plant in Kerala fully commissioned". timesofindia-economictimes. Retrieved 2015-11-08. ^ DuPont (12 September 2006). "U.S. Defense Agency Awards $5.7 Million to DuPont and MER Corporation for New Titanium Metal Powder Process" (Press release). Retrieved 1 August 2009. ^ Chen, George Zheng; Fray, Derek J.; Farthing, Tom W. (2000). "Direct electrochemical reduction of titanium dioxide to titanium in molten calcium chloride". Nature. 407 (6802): 361–364. Bibcode:2000Natur.407..361C. doi:10.1038/35030069. PMID 11014188. ^ "Titanium". Microsoft Encarta. 2005. Archived from the original on 27 October 2006. Retrieved 29 December 2006. ^ ASTM International (2006). Annual Book of ASTM Standards (Volume 02.04: Non-ferrous Metals). West Conshohocken, PA: ASTM International. section 2. ISBN 978-0-8031-4086-8. ASTM International (1998). Annual Book of ASTM Standards (Volume 13.01: Medical Devices; Emergency Medical Services). West Conshohocken, PA: ASTM International. sections 2 & 13. ISBN 978-0-8031-2452-3. ^ "Titanium". The Essential Chemical Industry online. York, UK: CIEC Promoting Science at the University of York. 15 January 2015. ^ "Solderability". Retrieved 16 June 2011. ^ Hampel, Clifford A. (1968). The Encyclopedia of the Chemical Elements. Van Nostrand Reinhold. p. 738. ISBN 978-0-442-15598-8. ^ Smook, Gary A. (2002). Handbook for Pulp & Paper Technologists (3rd ed.). Angus Wilde Publications. p. 223. ISBN 978-0-9694628-5-9. ^ Moiseyev, Valentin N. (2006). Titanium Alloys: Russian Aircraft and Aerospace Applications. Taylor and Francis, LLC. p. 196. ISBN 978-0-8493-3273-9. ^ a b Kramer, Andrew E. (5 July 2013). "Titanium Fills Vital Role for Boeing and Russia". The New York Times. Retrieved 6 July 2013. ^ "GlobalSecurity". GlobalSecurity.org. April 2006. Retrieved 23 April 2008. ^ Scharf, Caleb A. (June 17, 2016) The Jupiter Vault. Scientific American. ^ Kleefisch, E.W., ed. (1981). Industrial Application of Titanium and Zirconium. West Conshohocken, PA: ASTM International. ISBN 978-0-8031-0745-8. ^ Bunshah, Rointan F., ed. (2001). "Ch. 8". Handbook of Hard Coatings. Norwich, NY: William Andrew Inc. ISBN 978-0-8155-1438-1. ^ Bell, Tom; et al. (2001). Heat Treating. Proceedings of the 20th Conference, 9–12 October 2000. ASM International. p. 141. ISBN 978-0-87170-727-7. ^ National Corvette Museum (2006). "Titanium Exhausts". Archived from the original on 3 January 2013. Retrieved 26 December 2006. ^ Davis, Joseph R. (1998). Metals Handbook. ASM International. p. 584. ISBN 978-0-87170-654-6. ^ Mike Gruntman (2004). Blazing the Trail: The Early History of Spacecraft and Rocketry. Reston, VA: American Institute of Aeronautics and Astronautics. p. 457. ISBN 978-1-56347-705-8. ^ Lütjering, Gerd; Williams, James Case (12 June 2007). "Appearance Related Applications". Titanium. ISBN 978-3-540-71397-5. ^ "Denver Art Museum, Frederic C. Hamilton Building". SPG Media. 2006. Retrieved 26 December 2006. ^ "Apple PowerBook G4 400 (Original – Ti) Specs". everymac.com. Retrieved 8 August 2009. ^ "Body Piercing Safety". doctorgoodskin.com. Retrieved 1 August 2009. ^ "World Firsts | British Pobjoy Mint". www.pobjoy.com. Retrieved 2017-11-11. ^ "Orthopaedic Metal Alloys". Totaljoints.info. Retrieved 27 September 2010. ^ "Titanium foams replace injured bones". Research News. 1 September 2010. Retrieved 27 September 2010. ^ Pinsino, Annalisa; Russo, Roberta; Bonaventura, Rosa; Brunelli, Andrea; Marcomini, Antonio; Matranga, Valeria (2015-09-28). "Titanium dioxide nanoparticles stimulate sea urchin immune cell phagocytic activity involving TLR/p38 MAPK-mediated signalling pathway". Scientific Reports. 5: 14492. Bibcode:2015NatSR...514492P. doi:10.1038/srep14492. PMC 4585977. PMID 26412401. ^ Shoesmith, D. W.; Noel, J. J.; Hardie, D.; Ikeda, B. M. (2000). "Hydrogen Absorption and the Lifetime Performance of Titanium Nuclear Waste Containers". Corrosion Reviews. 18 (4–5). doi:10.1515/CORRREV.2000.18.4-5.331. ^ Carter, L. J.; Pigford, T. J. (2005). "Proof of Safety at Yucca Mountain". Science. 310 (5747): 447. doi:10.1126/science.1112786. PMID 16239463. ^ Elekes, Carmen Cristina; Busuioc, Gabriela. "The Mycoremediation of Metals Polluted Soils Using Wild Growing Species of Mushrooms" (PDF). Engineering Education. Archived from the original (PDF) on 3 March 2016. Retrieved 28 January 2014. ^ Berglund, Fredrik; Carlmark, Bjorn (October 2011). "Titanium, Sinusitis, and the Yellow Nail Syndrome". Biological Trace Element Research. 143 (1): 1–7. doi:10.1007/s12011-010-8828-5. PMC 3176400. PMID 20809268. ^ Cotell, Catherine Mary; Sprague, J. A.; Smidt, F. A. (1994). ASM Handbook: Surface Engineering (10th ed.). ASM International. p. 836. ISBN 978-0-87170-384-2. ^ Compressed Gas Association (1999). Handbook of compressed gases (4th ed.). Springer. p. 323. ISBN 978-0-412-78230-5. ^ Solomon, Robert E. (2002). Fire and Life Safety Inspection Manual. National Fire Prevention Association (8th ed.). Jones & Bartlett Publishers. p. 45. ISBN 978-0-87765-472-8. Barksdale, Jelks (1968). "Titanium". In Clifford A. Hampel. The Encyclopedia of the Chemical Elements. New York: Reinhold Book Corporation. pp. 732–738. LCCN 68029938. Donachie, Matthew J., Jr. (1988). TITANIUM: A Technical Guide. Metals Park, OH: ASM International. p. 11. ISBN 978-0-87170-309-5. Emsley, John (2001). "Titanium". Nature's Building Blocks: An A-Z Guide to the Elements. Oxford, England, UK: Oxford University Press. ISBN 978-0-19-850340-8. Flower, Harvey M. (2000). "Materials Science: A moving oxygen story". Nature. 407 (6802): 305–306. doi:10.1038/35030266. PMID 11014169. Roza, Greg (2008). Titanium (First ed.). New York, NY: The Rosen Publishing Group. ISBN 978-1-4042-1412-5.